In Food from the Radical Center, Gary Nabhan tells the stories of diverse communities who are getting their hands dirty and bringing back North America’s unique fare: bison, sturgeon, camas lilies, ancient grains, turkeys, and more. These efforts have united people from the left and right, rural and urban, faith-based and science-based, in game-changing collaborations. Their successes are extraordinary by any measure, whether economic, ecological, or social. In fact, the restoration of land and rare species has provided—dollar for dollar—one of the best returns on investment of any conservation initiative. Ethnobiology holds a special place in the hearts and minds of many because of its dedication to celebrating the knowledge and values of some of the most distinctive cultural practices in some of the most distinctive places on Earth. Yet we live in a world of diminishing natural and linguistic diversity. Whether due to climate change or capitalism, homogeneity is trumping the once-resplendent heterogeneity all around us. In this important new collection, Gary Paul Nabhan puts forth a call for the future not only of ethnobiology but for the entire planet. He articulates and broadens the portfolio of ethnobiological principles and amplifies the tool kit for anyone engaged in the ethnobiosphere, those vital spaces of intense interaction among cultures, habitats, and creatures. The essays are grouped into a trio of themes. The first group presents the big questions facing humanity, the second profiles tools and methodologies that may help to answer those questions, and the third ponders how to best communicate these issues not merely to other scholars, but to society at large. The essays attest to the ways humans establish and circumscribe their identities not only through their thoughts and actions, but also with their physical, emotional, and spiritual attachments to place, flora, fauna, fungi, and feasts. Gary Paul Nabhan takes the reader on a vivid and far-ranging journey across time and space in this fascinating look at the relationship between the spice trade and culinary imperialism. Drawing on his own family’s history as spice traders, as well as travel narratives, historical accounts, and an ethnobotanical exploration of spices and their uses, Nabhan describes the critically important roles that Semitic peoples and desert floras had in setting the stages for globalized spice trade. Traveling along four prominent trade routes—the Silk Road, the Frankincense Trail, the Spice Route, and the Camino Real for chiles and chocolate—Nabhan follows the caravans of itinerant spice merchants from the frankincense-gathering grounds and ancient harbors of the Arabian Peninsula, to the port of Zayton on the China Sea, to Santa Fe in the desert Southwest. His stories, recipes, and linguistic analyses of cultural diffusion routes reveal the extent to which aromatics like cumin, cinnamon, saffron, and peppers became adopted worldwide as signature ingredients of diverse cuisines. Cumin, Camels, and Caravans demonstrates that two particular desert cultures often depicted in constant conflict—Arabs and Jews—have spent more of their history collaborating in the spice trade and suggests how a more virtuous multicultural but globalized society may be achieved in the future. 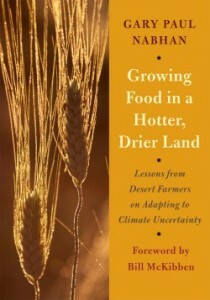 “Emulating and refining these adaptations may help us secure food in the face of climate change,” writes Nabhan. A certain type of agricultural history was made in 2011 when more than 500 food-producing counties in the continental United States were declared parts of disaster areas because they suffered weather-related crop failures. The searing heat waves and dry conditions suffered across seven-tenths of the United States during the summer of 2012 proved even more devastating: 2,228 counties were designated as federal disaster areas, where crops and livestock were either severely affected or lost to drought. Why does food taste better when you know where it comes from? Because history—ecological, cultural, even personal—flavors every bite we eat. Whether it’s the volatile chemical compounds that a plant absorbs from the soil or the stories and memories of places that are evoked by taste, layers of flavor await those willing to delve into the roots of real food. In this landmark book, Gary Paul Nabhan takes us on a personal trip into the southwestern borderlands to discover the terroir—the “taste of the place”—that makes this desert so delicious. To savor the terroir of the borderlands, Nabhan presents a cornucopia of local foods—Mexican oregano, mesquite-flour tortillas, grass-fed beef, the popular Mexican dessert capirotada, and corvina (croaker or drum fish) among them—as well as food experiences that range from the foraging of Cabeza de Vaca and his shipwrecked companions to a modern-day camping expedition on the Rio Grande. Nabhan explores everything from the biochemical agents that create taste in these foods to their history and dispersion around the world. Through his field adventures and humorous stories, we learn why Mexican oregano is most potent when gathered at the most arid margins of its range—and why foods found in the remote regions of the borderlands have surprising connections to foods found by his ancestors in the deserts of the Mediterranean and the Middle East. By the end of his movable feast, Nabhan convinces us that the roots of this fascinating terroir must be anchored in our imaginations as well as in our shifting soils. In Where Our Food Comes From , Gary Paul Nabhan weaves together Vavilov’s extraordinary story with his own expeditions to Earth’s richest agricultural landscapes and the cultures that tend them. Retracing Vavilov’s path from Mexico and the Colombian Amazon to the glaciers of the Pamirs in Tajikistan, he draws a vibrant portrait of changes that have occurred since Vavilov’s time and why they matter. In his travels, Nabhan shows how climate change, free trade policies, genetic engineering, and loss of traditional knowledge are threatening our food supply. Through discussions with local farmers, visits to local outdoor markets, and comparison of his own observations in eleven countries to those recorded in Vavilov’s journals and photos, Nabhan reveals just how much diversity has already been lost. But he also shows what resilient farmers and scientists in many regions are doing to save the remaining living riches of our world. Renewing America’s Food Traditions is a beautifully illustrated dramatic call to recognize, celebrate, and conserve the great diversity of foods that gives North America its distinctive culinary identity that reflects our multicultural heritage. It offers us rich natural and cultural histories as well as recipes and folk traditions associated with the rarest food plants and animals in North America. In doing so, it reminds us that what we choose to eat can either conserve or deplete the cornucopia of our continent. While offering a eulogy to a once-common game food that has gone extinct—the passenger pigeon—the book doesn’t dwell on tragic losses. Instead, it highlights the success stories of food recovery, habitat restoration, and market revitalization that chefs, farmers, ranchers, fishermen, and foresters have recently achieved. Through such “food parables,” editor Gary Paul Nabhan and his colleagues build a persuasive argument for eater-based conservation. The landscapes, cultures, and cuisines of deserts in the Middle East and North America have commonalities that have seldom been explored by scientists—and have hardly been celebrated by society at large. 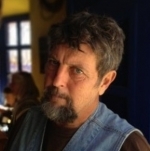 Sonoran Desert ecologist Gary Nabhan grew up around Arab grandparents, aunts, uncles, and cousins in a family that has been emigrating to the United States and Mexico from Lebanon for more than a century, and he himself frequently travels to the deserts of the Middle East. In an era when some Arabs and Americans have markedly distanced themselves from one another, Nabhan has been prompted to explore their common ground, historically, ecologically, linguistically, and gastronomically. Arab/American is not merely an exploration of his own multicultural roots but also a revelation of the deep cultural linkages between the inhabitants of two of the world’s great desert regions. Here, in beautifully crafted essays, Nabhan explores how these seemingly disparate cultures are bound to each other in ways we would never imagine. With an extraordinary ear for language and a truly adventurous palate, Nabhan uncovers surprising convergences between the landscape ecology, ethnogeography, agriculture, and cuisines of the Middle East and the binational Desert Southwest. Nabhan, an ethnobiologist and nutritional ecologist, examines how our ethnicity determines our digestion. He explains why modern native Americans are prone to diabetes, and why Mediterranean diets generally work best for those whose forbears came from the Mediterranean. He urges us to learn about the foods our particular ethnic group used to stay healthy in the home country, and to apply that knowledge to the food choices we make. Where have all these heirloom vegetables and heritage breeds gone? When Gaspar Pérez de Villagrá wrote about visiting the Pueblos of New Mexico in 1598, diversity on the farm and on the table was the norm—not the exception—across most of North America. Today, roughly four hundred years later, two-thirds of the distinctive seeds and breeds which then fed America have vanished. One in fifteen wild, edible plant and animal species on this continent has diminished to the degree that it is now considered at risk. These declines in diversity bring losses in traditional ecological and culinary knowledge as well. Consequently, we have suffered declines in the food rituals which otherwise link communities to place and cultural heritage. In recent years, the West has suffered from unprecedented stand-replacing wildfires, and the government has invested more money in preventative forest thinning than ever before. This forest crisis has led to much controversy over the Healthy Forests legislation passed by Congress in 2003. On the Colorado Plateau, it has also spurred heated debates regarding the degree to which thinning can truly serve to restore wooded habitats and what reference conditions and or restoration goals are needed to guide such plans. This book offers a primer for understanding how diverse land-use histories have impacted the health of pine-dominated ecosystems in the West and points to measures for better managing them in the future.